The Galaxy Tab 4 Nook tablet has a 7-inch screen and is bundled with B&Ns Nook software to read e-books and watch movies. The tablet is the first product from the alliance the companies announced in June. E-book reading is growing and remains an important part of tablets, said Mike Huseby, CEO of B&N, at an event Wednesday in New York to announce the product. Nook software will allow users to download text-only and multimedia books and get recommendations, Huseby said. "It's the first full-featured Android tablet optimized for reading," Huseby said. With the Galaxy Tab 4 Nook, B&N is attempting to catch up with Amazon. The aim of both retailers is to tie tablets closely to e-books, video and other content. Amazon has its line of Fire smartphone and tablets. Samsung's tablet market share is growing, but the company has had trouble selling multimedia content. Last month the company shut down its Video Hub service, which sold movies and TV shows, and is now relying on Google Play's video and e-book stores for content services. Samsung has said that partnerships are the way to go to sell e-books and other multimedia services. Through Nook Today software, users can get top book recommendations. The Nook Shop has millions of e-books, and a large collection of magazines and newspapers. Multiple users can create different profiles in a tablet to store e-books, videos and other content. B&N also sells movies and TV shows. The tablet is available in B&N's stores and website. Samsung has customized the hardware for heavy e-book readers. The tablet has a battery life of 10 hours and a Marvell PXA 1088 processor. It also has a 3-megapixel back camera and 1.3-megapixel front camera. It weighs 276 grams, has a 1280 x 800-pixel screen, 8GB of storage, 802.11 a/b/g/n Wi-Fi, GPS and a micro-SD slot. 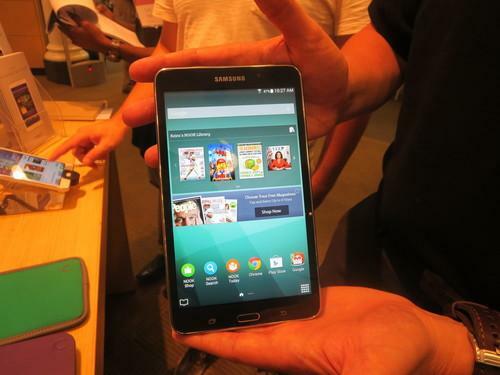 Samsung already sells Galaxy Tab 4 tablets, but without Nook software. The tablets run on Samsung's Exynos processors, and are capable of rendering high-definition video. A 7-inch tablet is sold for $179.99, an 8-inch for $249.99 and a 10.1-inch version for $319.99.